During late 1944 the Luftwaffe introduced the jet fighter, a sensational revolution in aviation technology. 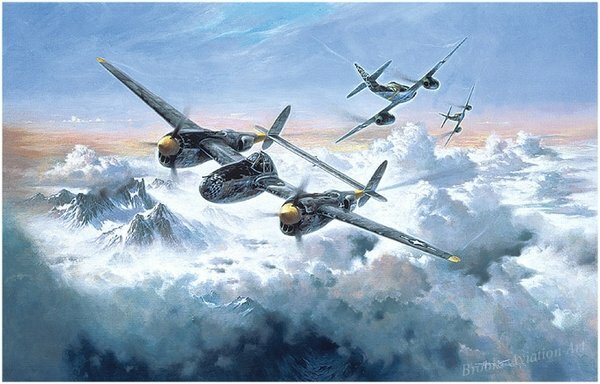 The scene depicted here is high above the Tyroloan Alps, where the beginning of the winter of 1944/45 aircraft of the 15th Air Force often clashed with Me-262s. A 94th Fighter Squadron P-38 Lightning and Me-262s of Ekdo Lechfeld have passed one another in a high speed, head on encounter, and are about to turn into the ensuing aerial battle.